The New York Times is under fire from pro-Israel activists for publishing what they say is a biased hit piece that glorifies terrorism. Provocatively titled "Is This Where the Third Intifada Will Start?" the 8,000-word piece tells the story of a Palestinian village fighting "against the Israeli occupation." Author Ben Ehrenreich, a noted anti-Zionist, spent several weeks living in the West Bank town of Nabi Saleh with a popular Palestinian family that organizes weekly protests against Israel. The piece portrays the family—members of which have been imprisoned by the Israelis for inciting violence—as the David to Israel’s Goliath in the fight to establish an independent Palestine. Arnold Roth, an Israeli blogger whose daughter was killed by a terrorist from Nabi Saleh, argued that the article was pure "advocacy journalism." "If consumers of the news believe they are being given objective reality when they read and view what is served up to them, they are unaware of just how ill-informed and agenda-driven so many of the practitioners in the news-packaging industries are," Roth told the Free Beacon. New York Times spokeswoman Eileen Murphy defended the feature. "Sunday’s magazine story was intended to provide a close-in look at one particular perspective in the Mideast conflict and we think it did so thoughtfully and sensitively," Murphy told the Free Beacon via email. Media experts also criticized the Times for stirring up anti-Israel sentiment ahead of Obama’s visit. "NYT Magazine’s decision to publish such terrorist chic agitprop, providing a liberal Hechsher [seal of approval] for those who wish to begin a new, violent intifada, confirms what I've been fearing for a long time: The NYT is slouching towards the ideological extremism of the Guardian," said Adam Levick, the managing editor of CiF Watch, an affiliate of the Committee for Accuracy in Middle East Reporting in America (CAMERA). "The elitists who write such propaganda under the guise of respectable journalism are toying with Israeli lives," Levick said. Ehrenreich’s article contained several serious accusations, including the claim that an unprovoked Israeli border officer threw stun grenades at a group of protesting Palestinian children. Ehrenreich also went to great lengths to portray the Palestinian villagers as peaceful freedom fighters despite their history of violence. Nabi Saleh is known in Israel as a hotbed of "popular resistance," spawning many "martyrs on the alter of freedom," Roth pointed out on his anti-war blog, "This Ongoing War." Ehrenreich quotes Palestinian activist Bassem Tamimi, the article’s central character, as endorsing armed struggle. "Taking up arms wasn’t, for Bassem, a moral error so much as a strategic one," Ehrenreich writes. "He and everyone else I spoke with in the village insisted they had the right to armed resistance; they just don’t think it works." "In 1993, Bassem told me, his cousin Said Tamimi killed a settler near Ramallah. Eight years later, another villager, Ahlam Tamimi escorted a bomber to a Sbarro pizzeria in Jerusalem," Ehrenreich wrote. "Fifteen people were killed, eight of them minors. Ahlam, who now lives in exile in Jordan, and Said, who is in prison in Israel, remain much-loved in Nabi Saleh." Ahlam Tamini "planned and helped execute a massacre in the center of Jerusalem on a hot summer afternoon in 2001," Roth wrote on his blog. "She chose the target, a restaurant filled with Jewish children. And she brought the bomb." Roth, whose daughter was murdered in that 2001 attack, said Ehrenreich fundamentally misunderstands the conflict. "Perhaps to Ehrenreich, perhaps to Bassem Tamimi, I am the party with the upper hand in the conflict," Roth told the Free Beacon. "But it does not feel that way to me." Some pro-Israel observers argued that Ehrenreich’s past statements about Israel prove that he is incapable of impartiality on the matter. "The bad news is that the Times' profile was a viciously unbalanced piece of anti-Israel propaganda. The good news is that since it was such a viciously unbalanced piece of anti-Israel propaganda it probably didn’t change any minds but reinforced the Times’ reputation for unfailr anti-Israel animus," said one prominent pro-Israel activist who requested anonymity. Ehrenreich is perhaps best known among pro-Palestinian activists for his 2009 essay arguing, "Zionism is the problem." Ehrenreich wrote that Israel is sliding towards "ethnic cleansing" and condemned "the deplorable conditions in which Palestinians live and die in Gaza and the West Bank." "For the last several decades, though, it has been all but impossible to cry out against the Israeli state without being smeared as an anti-Semite, or worse," he wrote. "To question not just Israel's actions but the Zionist tenets on which the state is founded has for too long been regarded an almost unspeakable blasphemy." Given Ehrenreich’s anti-Israel background, critics maintain that his Times piece should be viewed as nothing more than "propaganda." "Ehrenreich's article is a pathetically one-sided piece of propaganda," said David Brog, executive director of Christians United for Israel. "His readers will never know that there could have been a Palestinian state in 2000, 2001, and 2008 if only the Palestinians would have accepted Israel's offers to create one," Brog said. 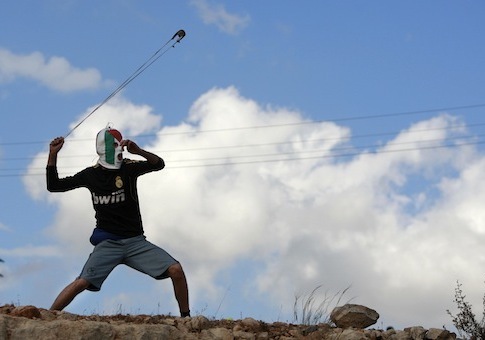 "Yes, rock throwing is better than suicide bombing. But peace would be better yet." The Times has a history of publishing anti-Israel articles, according to CAMERA. Nearly 190 of 275 New York Times articles about Israel in the second half of 2011 criticized the Jewish state while 88 were critical of the Palestinians, according to a survey conducted by CAMERA. Ehrenreich did not respond to a Free Beacon request for comment sent via a form on his website. Even the liberal Israeli daily, Haaretz, condemned the piece as a "pro-Palestinian manifesto." "The article, which some may interpret as encouraging a third intifada, is decidedly sympathetic to the Palestinian cause and hostile both to the IDF as well as to the Palestinian ‘Ramallah bubble’, which, the author maintains, serves as an inhibitor to the ‘popular struggle’ of Palestinian villagers," wrote blogger Chemi Shalev. Haaretz’s surprising attack on the Times led Wall Street Journal editor Tom Gara to fire off a snarky Tweet. "Some excellent passive aggressiveness in this Haaretz piece on the NYT‘s big Naba," Gara tweeted. The message prompted sharp reply from Huffington Post blogger Joshua Hersh. "*Passive* aggressive?" Hersh replied. "Damn, that column is straight out the free beacon." "The subsequent character assassination [in the article] is pure combat journalism," he followed up. Hersh is believed to be referring to the Washington Free Beacon and its editor-in-chief’s first editorial. This entry was posted in National Security and tagged Israel, Media, Middle East, New York Times. Bookmark the permalink.